UPDATE: 2:18 p.m. EST — Florida Sen. Marco Rubio tweeted that he was “praying for the victims and everyone” at Fort Lauderdale-Hollywood International Airport after a shooting Friday that left multiple people dead. As many as five people were killed after a gunman opened fire in the baggage area of Terminal 2 at the airport, according to multiple reports. One person has been taken into custody. Meanwhile, Florida Gov. Rick Scott issued a statement to ABC News indicating he was en route to Fort Lauderdale to meet with law enforcement officials. UPDATE: 1:48 p.m. EST — The Broward County Sheriff confirmed on Twitter that there had been a shooting Friday that killed “multiple people” at the Fort Lauderdale-Hollywood International Airport. Multiple reports have indicated that at least nine people had been injured in the attack. UPDATE: 1:44 p.m. EST — A gunman opened fire Friday at the Fort Lauderdale-Hollywood International Airport, wounding at least nine people. Conflicting reports have indicated there may be anywhere from one to five people dead. The situation appeared to be ongoing, although multiple reports indicated a person had been taken into custody. 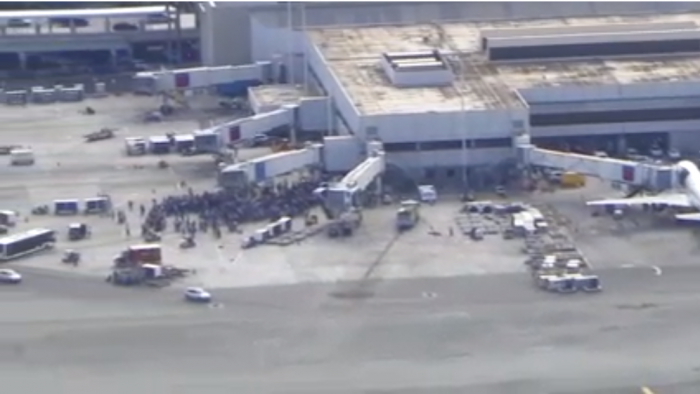 UPDATE: 1:37 p.m. EST — A gunman opened fire Friday at the Fort Lauderdale-Hollywood International Airport, wounding at least nine people, according to multiple reports. Live video of the airport can be found here, for those who want to follow what it is going on at the scene. UPDATE: 1:27 p.m. EST — There has been a shooting Friday at the Fort Lauderdale-Hollywood International Airport, according to multiple reports. One person has been killed, while nine others have been shot, according to NBC News. Multiple reports indicated a shooter was in custody. There is an ongoing incident in Terminal 2, Baggage Claim. Media availability is at the staging area. The Fort Lauderdale-Hollywood International Airport is the 21st busiest airport in the United States, according to its website, with flights to more than 100 cities around the world. This past October, the airport made the news when a FedEx cargo plane caught fire as its landing gear collapsed. Nobody was injured. UPDATE: 1:21 p.m. EST — After previous reports of a shooting Friday at the Fort Lauderdale-Hollywood International Airport, an account seemingly belonging to the airport tweeted there was an “ongoing incident in Terminal 2, Baggage Claim.” NBC News’ Bradd Jaffy reported that one person had been killed, while nine people had been shot. @FLLFlyer where is the stagin area? UPDATE: 1:17 p.m. EST — One person has died and nine people were shot at the Fort Lauderdale-Hollywood International Airport Friday, according to NBC News’ Bradd Jaffy on Twitter. There was an apparent shooting Friday at the Fort Lauderdale International Airport, according to various media reports and tweets from Ari Fleischer, former White House press secretary. A public information officer confirmed to WPEC that there was “some type of shooting incident” at the airport. Some 73,000 people travel through the airport every day, according to Broward County. Other people claiming they were at the airport tweeted about a shooting as well.